Push around manlifts are small and more compact than other types of lifts, offering height ranges of anywhere between 15 and 50 feet. They are exceptionally well-suited for single-worker jobs like maintenance, ceiling work, HVAC ductwork, camera manipulations such as photography, and other tasks that require workers to be able to get up high in a tight space. You can even rent push around manlifts of various heights and sizes if you have different job requirements on the same job sites. Push around manlifts come in many different brands, models, and variations, so no matter what job you have, there's a right model to get the job done. One doesn't have to be a contractor to need a push-around lift. In fact, photographers and videographers use them for aerial shots, zoom-ins, or zoom-out shots. Some jobs require workers to have specialized power tools, while other jobs require working at heights and positions that just aren't optimal for a ladder. No matter the job or height requirement, BigRentz has the equipment you need. What Is a Push Around Manlift? Some jobs require you to work at heights where a stepladder just isn't safe to use. These are the situations where workers turn to personal lifts, also called push around manlifts. Push around manlifts are lightweight compared to some of their larger, self-propelled cousins, and when collapsed they usually measure about 5 to 6 feet tall and 2 to 3 feet wide. These lifts come equipped with a single-worker aerial platform and a single vertical mast. Unlike some of their larger cousins, push around manlifts have an average carrying capacity of 200 to 400 pounds. Even though they weigh around 1000 pounds, their wheels and suspension give them the ability to be moved to the job site easily by one or two people. Their lightweight may also cause them to tip over. For this reason, they come equipped with outriggers which stabilize their load. There are also self-propelled models which can be driven from controls located on the aerial platform. Push around manlifts are made for a single worker and their tools. 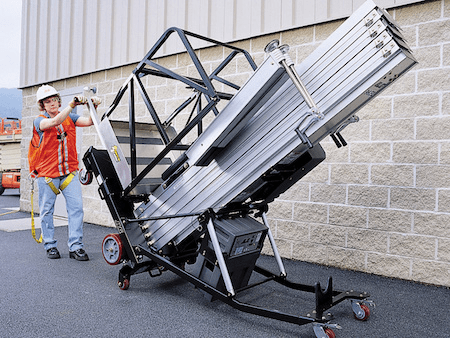 These small manlifts are perfect for indoor jobs like ceiling repairs, painting rafters, ductwork, electrical jobs, photography, videography, and various other tight-space jobs a ladder can't reach. Keep in mind that whenever you utilize a manlift, precautions must be taken to ensure the safety of everyone around the lift. There are many different kinds of aerial lifts to choose from, and choosing the right style for your specific job is essential. Hearing names like atrium lift, boom lift, articulated lift, and scissor lift, your choices can seem overwhelming. Contractors have to make sure that they are getting the right tool for the right job, as well as getting maximum efficiency for their money. Here are a few simple questions you can ask yourself to see if the push around lift is right for you. Is This an Indoor Job? Push around lifts are meant for indoor jobs unlike motorized scissor lifts, and also have no horizontal movement like atrium man lifts. They are intended for getting very precise work done in confined spaces. Push around lifts are not meant to be used on uneven ground; for those, you would normally want to go with a spider lift or an atrium lift. Does the Job Require More Than One Worker? Push around manlifts are made to carry a single worker and their tools. The platforms will not accommodate more than one worker and push around lifts have an upper capacity of about 400 pounds. If more than one worker is required, then a scissor lift, which has a broader platform and a more stable lift mechanism, would be a better choice. Can You Get Directly Under the Work Area? Push around manlifts are made to go straight up and down. 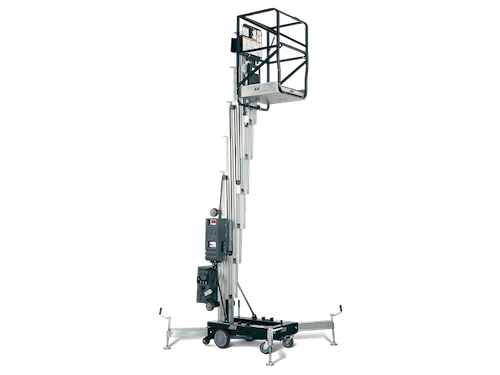 The riser on a push around manlift is a single mast, with no horizontal articulation, so you have to be able to get right under your work area. Many contractors in toda's market are investing in their lifts, especially commercial HVAC installers and electricians. These types of jobs use lifts extensively, so it makes sense to have one at their disposal. A good rule of thumb is that you should buy if you are going to have enough use for a piece of equipment that your earnings from using it will outweigh the cost of renting the equipment. In most cases, it is a good idea to rent equipment. If the machinery isn't being used enough, renting is a cost-efficient option. When it comes to quality push around manlifts, there are two big name brands in the industry: JLG and Genie. Both of these makers offer various models of vertical mast manlifts in a range of heights and with various options to suit any job that might be needed. Both JLG and Genie lifts are highly rated by contractors and industry insiders and represent the best in push around manlift technology. JLG was started in 1969 after founder John L. Grove left the successful crane manufacturing company he helped found. He discovered a business need for a machine that could safely lift workers into the air for construction and maintenance functions. JLG likes to say that innovation never stops, and ever since 1969 they've been continuously improving on their designs and setting industry standards. JLG push around manlifts are meant to eliminate the need for ladders and scaffolding. When collapsed, JLG push around manlifts can fit through standard doorways, roll down narrow aisles, and go almost anywhere you need them to go. Their AM and AMI series deliver a whole new level of performance and value. 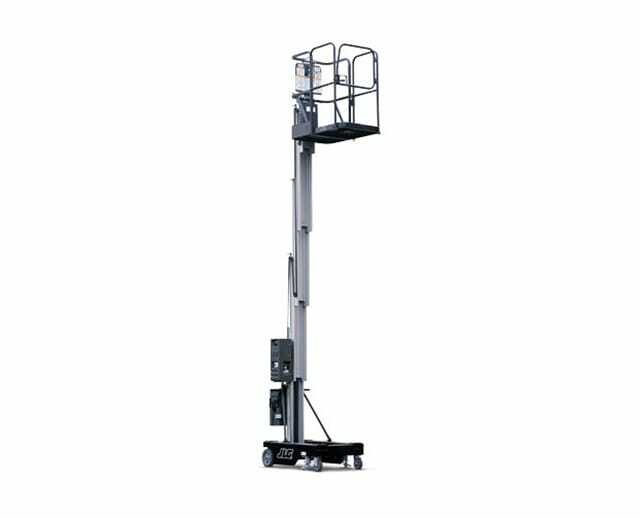 Ranging in height from 19 feet up to 41 feet, they are made to be easily transportable and versatile. All models offer a six-wheel design for greater maneuverability and improved battery life for longer work times between charges. All of their platforms are made to be easily changed out within one minute without tools. Genie focuses on two things in their business: having a global reach and maintaining an individual focus. Genie began in 1966 with the Genie Hoist, a portable pneumatic material lift. From there a series of additional material lifts and aerial work platforms were created to meet customer demands. Ever since their inception, Genie lifts have been recognized worldwide as an industry leader in quality and design. There are two distinct models of Genie man lifts — the AWP series and IWP series. The AWP Super series allows for changeable platforms to suit any needs, as well as three different base combinations. The Outrigger platforms are smaller allowing for closer access to walls, and their tilt-back frames allow them to roll through standard doorways. The IWP Super Series is counterbalanced, so no outriggers are needed. The IWP also comes with integrated leveling jacks for maximum stability. There are several options for platforms to choose from, and the IWP comes with two different bases to choose from. 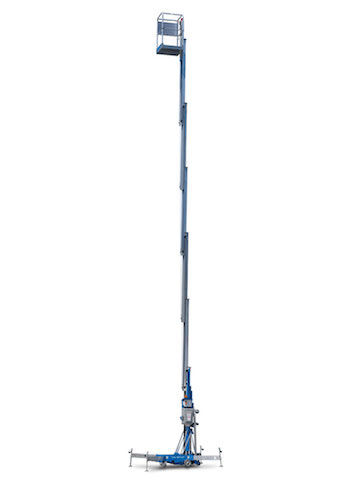 The durable patented aluminum masts come in a range of heights from 26 feet to 35 feet. When jobs require workers to be lifted into the air, you have a few different options to hoist them up. Push around lifts are best used for confined spaces and overheads. Atrium lifts have a greater reach and are good if you need to extend the worker over an open area or have rough terrain. Boom lifts are the big daddy of aerial lift; they can handle bigger weights and lift higher. Articulating booms can even change position without lowering the basket. The Push around manlift is best suited for indoor jobs. They are compact, and when folded up they can easily fit through standard doorways. They are lighter than atrium lifts and boom lifts so that they can be pushed along by a single worker on their hydraulic wheels. Jobs best suited for the push around lift are stationary maintenance tasks like electrical work, welding, sign hanging, ceiling work, HVAC ducts, and other general maintenance. The push around manlift is meant for tasks that can be done by a single worker. If more than one worker is needed to complete the task, a scissor lift is a better bet. If your job needs to go outdoors or over rough terrain, then an atrium lift is probably the best option. 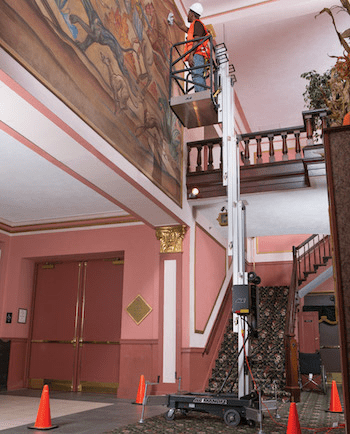 If you need to go higher than 50 feet or have more than one worker who needs to go up to the height of an atrium lift, then you want a full-scale boom lift because they have larger platforms and can handle more weight and height. Every job has different requirements, and choosing the right equipment for the job is an essential part of every contractor's life. If you own one particular kind of lift but have a need of another type to suit your job better, you should consider Bigrentz.com. There you can get push around manlifts, atrium lifts, and boom lifts in various sizes. Safety is always the number one concern on any job site. According to the Occupational Safety and Health Administration (OSHA), the leading cause of accidents on a job site is operator error. Whether they are caused by lack of focus, inattention to safety protocols, or insufficient training, accidents cause downtime, and in the worst cases fatalities. Accidents do happen, however, so it's important to be aware of the potential risks involved with any equipment being used. For push around manlifts, there are several potential hazards workers need to be aware of. OSHA lists the “big four” causes of hazards. According to OSHA, these four hazards account for 63 percent of all fatalities on construction sites. When working at heights, it is important to always wear appropriate safety gear. Workers should always be belted and harnessed while being lifted and while working on aerial platforms. Workers should never belt themselves off to an adjacent pole or object while working from an aerial platform and should always use a body harness attached to the boom or basket to prevent being ejected or pulled from the platform. Workers being struck by tools or materials falling from the aerial platform is a serious hazard. All workers should wear hard hats regardless of their job task on the construction site. There should also always be an established and clearly marked danger zone around the lift support vehicle. When working up in the air, chances are at some point you'll have to work near power lines. A minimum safe distance of 10 feet should always be maintained from the nearest overhead line. Workers should also never attempt to override electrical safety mechanisms on the equipment. You should always treat all loose electrical wiring as live wires. If you're not licensed as an electrician, hire one to help deal with any loose or broken electrical wires. Never allow workers to position themselves between overhead hazards like joists and beams, and the basket. Make sure workers are clear of the danger zone before the equipment is moved as well. Accidents are expensive because they cause delays and more materials cost. Injuries during accidents are even more costly due to insurance deductibles and possible lawsuits. Human error is one of the leading causes of accidents on the job site, and so by following proper safety procedures and protocols, the number of accidents can be drastically reduced. This is precisely the reason why BigRentz.com offers complete safety and operations manuals for every piece of equipment they rent. Working with or on aerial lifts presents a few additional safety concerns above and beyond normal protocols on the job site. First and foremost, never let anyone who is not properly trained operate the equipment. Proper safety inspection of all equipment is also a key component of a successful safety procedure. These checkouts prevent crush accidents, and potentially caught-in-between and electrocution accidents. Everything needs to be in proper working order, and all safety mechanisms must be working properly. Once the job starts, always mark the work area as a danger zone clearly to prevent people being struck by falling objects. All brakes and wheel locks must be set, and wheel chocks put in place before raising the aerial platform height. Workers should always be body harnessed into the basket when working. The maximum load limits (the combined weight of the worker, the tools, and the materials) should never exceed the capacity of the machine. Never move the equipment with workers elevated unless the lift is specifically designed to do so. OSHA states that the number one cause of accidents on construction sites is operator error. One of the biggest causes of operator error is a failure to follow proper safety procedures. It is the worker's responsibility to make sure that all protocols are followed, and it is the company's job to ensure that all workers are properly trained on the safety procedures. Safety should always be job one on any job site. Preventing accidents and injuries saves the workers money in medical bills and insurance premiums and saves the company money from downtime delays and potential lawsuits. Proper equipment training is essential for any successful safety protocol. Not only does proper training drastically cut down on potential accidents, but most states require workers to be trained as well. The consequences for letting untrained workers operate machinery can be quite severe. Companies can lose their bonding, insurance companies can refuse to pay claims, clients can file lawsuits, and the company can lose their license or even be dissolved altogether. It is most definitely in the company's best interest to make sure anyone operating equipment on their site is properly trained. There are a few different ways to get licensed to operate lift equipment. One of the best and easiest is online through Genie Lift Pro Online Training. Genie developed a two-part program to effectively train workers in the standardized aerial controls and safety procedures. This program is aimed at reducing accidents and reducing repair costs due to improper operation. The first part of the program is offered through a web-based platform. This is designed to satisfy the general requirements for aerial work platform training required by ANSI, OSHA, and the CSA. After the online portions of the training are complete, there is a 57-question exam that has to be passed to demonstrate knowledge. After the exam is complete, a hands-on familiarization from a qualified professional must be done to complete the training process. Genie's training program is a valuable resource since they are one of the industry leaders in lifts, and it's more than likely you'll run into a piece of their equipment on the job site. The Occupational Safety and Health Administration (OSHA) also offers an online training program. This program offers a similar format to the Genie program. It begins with an online portion which is web-based to familiarize yourself and learn the controls. Afterward, there is an exam and an on-site familiarization before the trainee can be considered qualified. How do I rent a push around manlift? You can rent directly from BigRentz.com. You are also responsible for making sure all operators are properly trained. For how long can I rent a push around manlift? BigRentz offers rentals by the day, week, or month. Can I use power tools on a push around manlift? The push around manlift is large enough to accommodate a single worker and their tools. You can safely operate tools from the platform. Many of the lifts that BigRentz offers have outlets built in, so you can plug in your tools once you're up high and near your job. Do I need to wear a harness when on a push around manlift? OSHA standards state that workers should always be harnessed and belted to the basket or boom while working. No. For your safety, and due to limitations posed by the company's insurance policy, their haulers must be used for all equipment deliveries and pickups. In most cases, yes. The Damage Waiver may cover the incidental damage. For complete details on our rental policies, please refer to the Terms & Conditions outlined in the provided Rental Agreement. For more answers to your questions, please read our full Frequently Asked Questions section. Not all jobs are created equal, and some jobs are in tight, enclosed spaces where ladders are just no good. 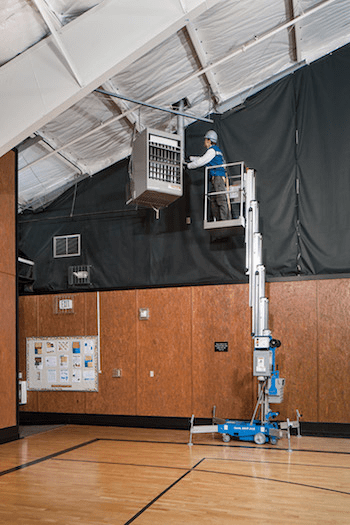 For indoor jobs such as ceiling repairs, HVAC ductwork, hanging signs, electrical work, replacing windows, and a host of other tasks, the push around manlift is the perfect tool for the job. They're lightweight compared with their heavy-duty cousins. They can fit through standard doorways when collapsed and offer more stability and reach than a ladder. Push around manlifts come in various sizes and include numerous options for customization, making them one of the most versatile tools on any job site. Whether you're working construction or filming a movie, a push around manlift may be beneficial to you. If you do a great deal of aerial work, you should consider purchasing one to keep around permanently. However, if you have different tasks within your project that require multiple sizes of lifts, then renting may be your best option. Check out the full offering of push around, atrium, and boom lifts available on BigRentz.com for more details.